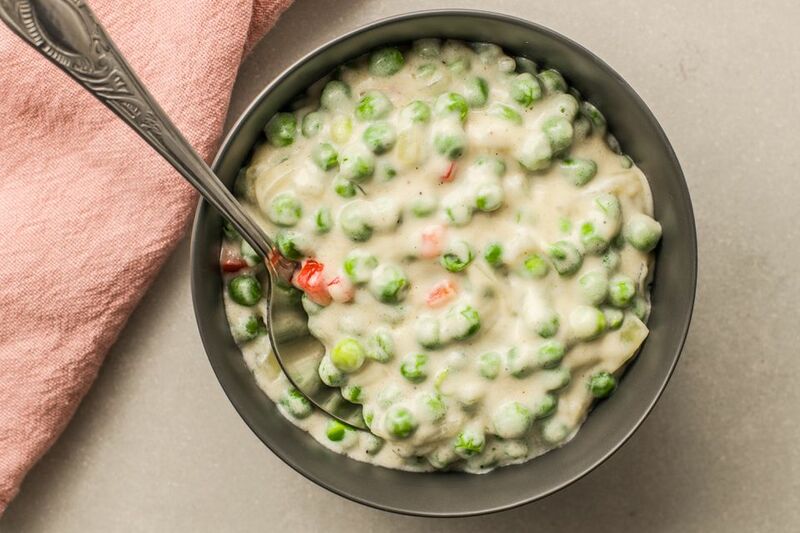 These creamed peas are easy to prepare and cook with a simple white sauce and seasonings. A little onion and pimiento give them color and flavor. Add some mild cheddar cheese or Parmesan to the peas, or make them with diced roasted red peppers or some bacon in the sauce. These creamed peas would make a nice addition to a Thanksgiving dinner menu. Combine onion, water, and 1 teaspoon salt in a saucepan. Bring to a boil over medium-high heat and boil for 5 to 7 minutes. Add the peas and cook for 5 minutes longer, or until peas are just tender. Drain the peas in a colander over a bowl and reserve 1/2 cup of the cooking liquid. In the same saucepan, melt the butter over medium-low heat. Add flour and seasonings, stirring until smooth and bubbly. Cook, stirring, for 2 minutes. Add the pimiento to the flour mixture along with the cream and the 1/2 cup of reserved liquid from vegetables. Cook, constantly stirring until thickened. Add the vegetables to the sauce and heat through. Serve with your choice of entrée and enjoy! Add about 1/4 to 1/2 cup of shredded cheese to the thickened sauce mixture. Add the vegetables and heat through. Add about 1/2 cup of sautéed sliced mushrooms to the sauce along with the peas.